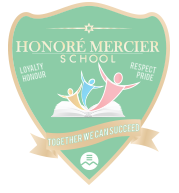 Honoré Mercier School is a bilingual school. Thus, from Kindergarten to the end of Cycle III, pupils receive approximately half of their instruction in French, with alternating days of French and English instruction. Students are taught physical education, art and music by specialists. In addition, Kindergarten pupils receive 170 minutes of Music, Dance and Physical Education per week, taught by a specialist. At the end of the year, a Kinderfest is organized at which time parents have the opportunity to see and experience for themselves the concepts their children have learned. Honoré Mercier School holds an annual Science Fair, involving students from grades 1-6. All of our students are winners, however 5 groups go on to present at the Bell Regional Science Fair.